BEACHFRONT LUXURY HIDEAWAY - Private enclave of 3 gated homes along crescent-shaped driveway. Architecturally designed 2-story hm w/Panoramic Ocean Views, Gorgeous Sunrise & Sunset Vistas. 2nd level offers Two Master Suites with ocean views + 2 guest bdrms. Main living areas with ocean views + office/guest bdrm on 1st level. Covered patio overlooks oceanside pool & spa. Fireplace, marble floors & artistic security gates. Secluded tranquil waterfront location in protected area x2013; swim, snorkel, paddle, or stroll on beach. Easy access to shopping/dining at Kahala Mall and in East Honolulu. GREAT VALUE FOR OCEANFRONT HOME IN HONOLULU! 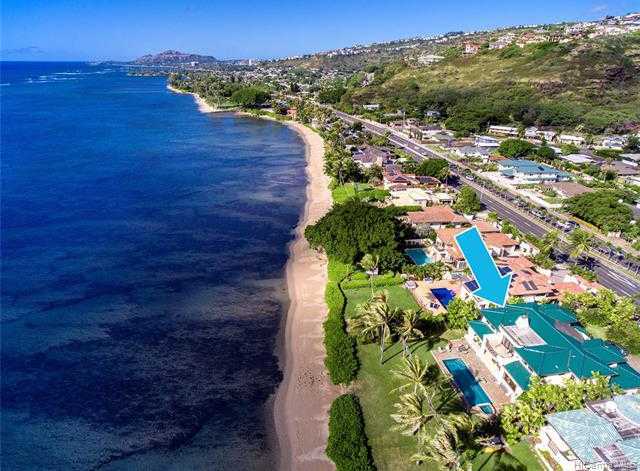 Please, send me more information on this property: MLS# 201831224 – $5,200,000 – 5599 Kalanianaole Highway, Honolulu, HI 96821.